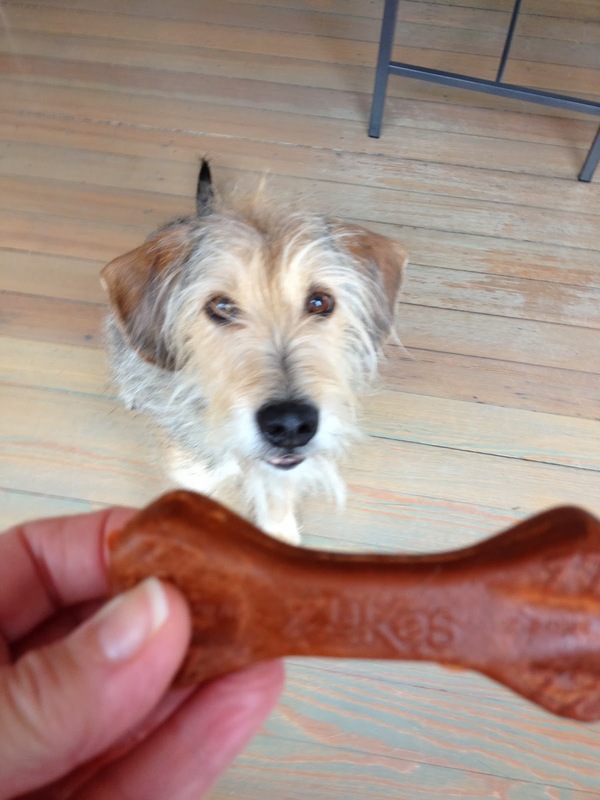 Zuke's "Z-Bones" Dental Chews: Review And Giveaway! You can win your very own 8 Pack of Zuke's Z-Bones in the size and flavor of your choice. See details at the end of this post to enter! On to our review...Parental Unit is always looking for some relatively pleasant way to clean some of that tartar from my teeth, and it appears that she's found that in Zuke's edible dental chews. 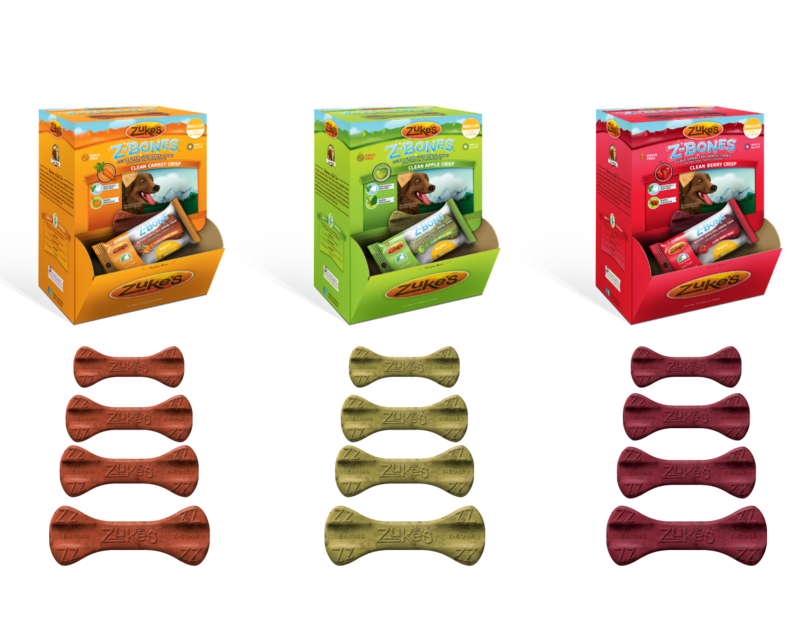 They come in sizes to fit every pooch and in a variety of flavors: Carrot, Berry and Apple. Important Note: These chews are not recommended for dogs under 10 pounds or less than six months of age. And we strongly recommend that you supervise your dog from "start to finish" when he's working on Z-Bones or any other dental chew. 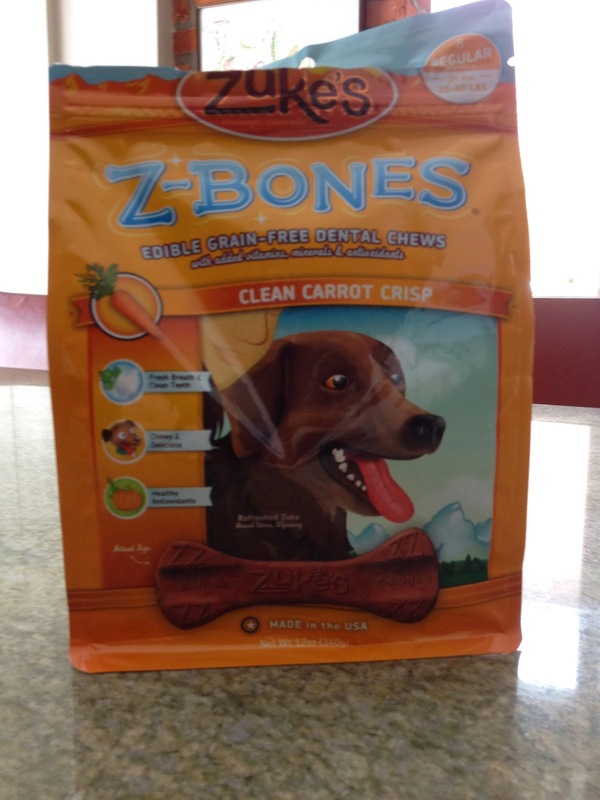 Since I weigh about 32 pounds and love carrots (I'm not into fruits), Parental Unit chose the "Regular Size" Z-Bones dental chews for dogs 25-60 pounds, in the "Clean Carrot Crisp" flavor. Here's my very own 8 Pack. You also know that Parental Unit doesn't eat anything herself, or feed anything to me, unless she's scrutinized the ingredient list using her reading glasses and near surgical level light source. The Z- Bone ingredients are potato and pea-based, and in our flavor, include carrots and pumpkin, plus Parsley, Alfalfa, Rosemary, Turmeric and Fennel. According to Zuke's information, the herbs "naturally freshen breath by supporting digestion." Here I am about to receive my first Zuke's edible dental chew. And when I get something I really like...I immediately run up to my "man cave" (under Parental Unit's bed) and start playing, or in this case chewing away. Although Parental Unit did not officially document her observations, she believes that Zuke's Dental Chews did remove a decent amount of tartar from my upper and lower molars. I've had four of these chews so far and can safely rate them a four paws up! And because Parental Unit approves of the ingredients and sees how much I enjoy them (plus that tartar removal thing), she gives them an enthusiastic two thumbs up! ONE lucky winner will receive one 8 Pack of Zuke's Z-Bone Edible Dental Chews in the size and flavor of their choice. This giveaway is limited to residents of the continental United States. This contest will run from today, Sunday February 16, 2014 through Saturday March 1, 2014 at 8:00 EST. we have seen these at our pet store - but gosh they are expensive so we haven't tried them yet so yes we would like to enter and have a chance to try them. We've never had the Zuke's dental bones. They sure do look yummy, Bocci! I did all of the above! Please enter me for this giveaway! I'd love to win these for my dogs, so consider this my entry. I liked your FB page, follow you on GFC, and tweeted to my Twitter page (@urdchan). Glad you enjoyed and they helped with cleaning your nashers. Have a marvellous Monday. I completed all the tasks. Thanks for the great giveaways! Sissy loves dental chews. I gave a shoutout on Twitter. Here's the link. I completed all. Zoey would be my girlfriend forever if I won these for her. She loves her treats. I have two Boston's that would love to try these bones. They love the other Zukes products that they have had. My dogs would love to try these :) I liked your FB page (Shelley Joy), follow you on GFC (Shelley), and tweeted (@ShellChis) to enter this giveaway. TY. I'd like to enter this giveaway! Please enter me in the giveaway!! Thank you! Following on GFC as Rachael H.
completed everything and want to enter...and win! Did all! Please enter me into the giveaway! I follow on Facebook & GFC and shared on Twitter. My pups would love to win some Zuke's Z-Bones!